"I think you should give up now." Monolith lives up to his name. At eight and a half feet tall, and extraordinarily muscled, he is an impressively massive individual. In contrast to his fearsome build, Monolith has a kind, boyish face. He doesn’t have a set uniform other than having a stylized “M” on his shirts. In all kinds of weather he typically wears a white tank top or t-shirt, weight lifting gloves, jeans, and specially-made high-top sneakers or combat boots. Monolith is good-natured and easy going, but he takes his responsibilities as a role model seriously. He volunteers for many children’s charities and lends his name and likeness to fund raising campaigns. People who spend time with Monolith are surprised that he is, in spite of his fame and his enormous size, just a regular guy who likes sports, movies, and popular music. He is also a talented public speaker who connects with audiences through stories about his superhero exploits, anecdotes about the difficulties he has due to his size and weight, and self-deprecating humor. Justice: The character seeks to ensure that misdeeds are met with appropriate punishment. Enemy: Monolith has made many enemies, but Cesspool is the most vile and persistent. Uncontrolled Power: Monolith's size and weight make it impossible for him to have a normal life. Wayne Hill was born in an abandoned worksite trailer deep in the backwoods of Oklahoma. His parents had committed a series of armed robberies crossing three states and were hiding from the FBI and state authorities. The trailer was left behind after an industrial company dumped experimental toxic chemicals at the site. The chemicals dramatically altered Wayne's physiology while he was in the womb. Due to Wayne's size and the absence of medical care, his mother died in childbirth. Wayne's father never forgave him, and the boy's early years were marked by abuse and neglect. When he was 10 years old, his father was killed in a shoot-out with authorities, so Wayne became a ward of the court and was placed in a federal orphanage for "special" children. As Wayne grew to maturity, he vowed to use his special abilities to help the less fortunate and downtrodden. 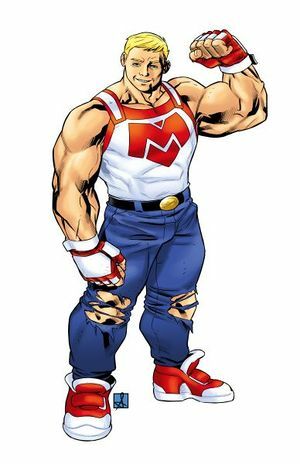 When he turned 18, Wayne took the superhero name Monolith, moved to Los Angeles, joined the Renegades (a state-sponsored team of posthumans), and became sanctioned by the state of California as a state police officer. When not fighting evil, he makes frequent charity campaign appearances, especially for organizations that help children. Monolith is strong enough to lift locomotives and punch through all but the most resilient synthetic materials, and he is tough enough to withstand an attack from any conventional weapon. He can survive in nearly any environment, and his posthuman biology is immune to virtually all toxins and diseases. Monolith's speed and agility are greater than his size might lead one to assume, but still well within human norms. However, his massive leg muscles allow him to jump extraordinary distances: his longest measured leap is well over two miles. This page was last modified on 5 December 2014, at 09:57.